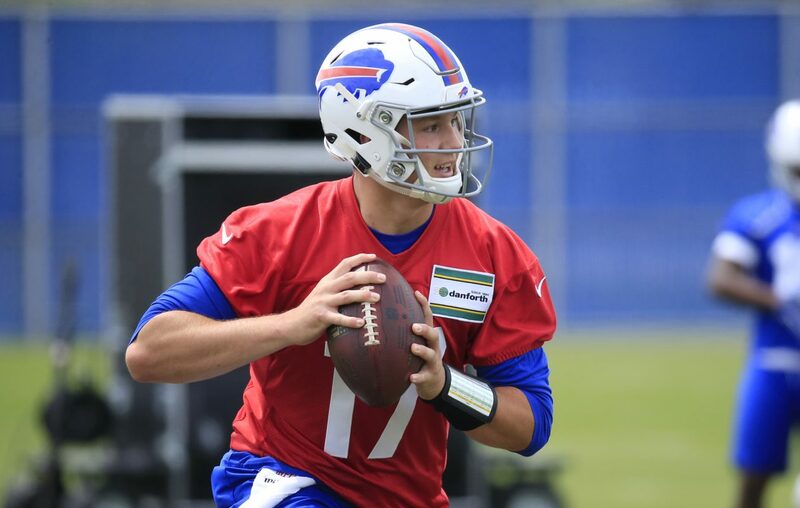 Buffalo Bills quarterback Josh Allen entered the post-draft portion of last year's preseason designated as the No. 3 quarterback on Buffalo's depth chart behind Nathan Peterman and AJ McCarron (get the jokes out of the way now). The seventh overall pick in the 2018 NFL draft was the Bills' starting quarterback by Week 2. But being lower on the depth chart in training camp and OTAs meant less practice time with the first units. This offseason, Allen and the Bills know the 22-year-old is the team's No. 1. Coach Sean McDermott said it should lead to a better flow. Speaking of quarterbacks: Sports Illustrated says the quality of the Allen-led quarterback group in Buffalo ranks 26th in the NFL. New Bills stadium would be 'scaled-down ... Buffalo style': Terry and Kim Pegula talked with reporters in Arizona. Terry didn't commit to building a new stadium over renovating New Era Field. But if a new stadium were to be built... "I think the answer is probably a scaled-down version of some of these palaces that are being built around the country," Terry Pegula said. The co-owners talked about stadiums, the Sabres and what's going on inside PSE. McDermott to Bills bashers: ‘Spend a day, spend a week in Buffalo': The short-lived Antonio Brown saga earlier this month had many around the league, from fans to media members, saying Buffalo wasn't a desirable location for free agents. Sean McDermott addressed that when he spoke with the media in Phoenix. "People want to pump palm trees and this and that and weather and this and that, come to Buffalo where football is important to the people,” he said. Antonio Brown wanted no part of Buffalo: The star wide receiver on Tuesday released a taped conversation between himself and agent Drew Rosenhaus that was made days before the deal to send him to Oakland went down. “Yeah, don’t even waste time,” Brown says to the possibility of playing in Buffalo, basically confirming that talks to acquire Brown from Pittsburgh didn't really get near the finish line. Bills reportedly release Ivory: The writing was on the wall for Chris Ivory when Buffalo signed Frank Gore to its backfield. ESPN's Adam Schefter reported Tuesday that Ivory would be released, a move that would come with savings against the salary cap. Kiper has the Bills taking a risk: Now that free agency has changed the needs of some teams, ESPN's Mel Kiper Jr. projects the Bills will take Michigan defensive end Rashan Gary with the ninth overall pick.